LA JOLLA, CA—As an arm of the innate immune system, white blood cells called neutrophils form the first line of defense against invading pathogens. Neutrophils spend most of their lives racing through the bloodstream, patrolling for bacteria or other foreign particles. Once they arrive at tissues besieged by infectious agents, they halt on a dime and then blast through the vessel wall to reach the inflammatory attack site. They do this by activating integrins, a class of adhesion receptors that can switch on in less than a second. Now, a paper published by La Jolla Institute for Immunology (LJI) researchers reveals an entirely unanticipated way in which neutrophil receptors grab onto a capillary wall in preparation to breach it, as well as a cute trick they use to keep cells from sticking to each other or busting through the wrong place. 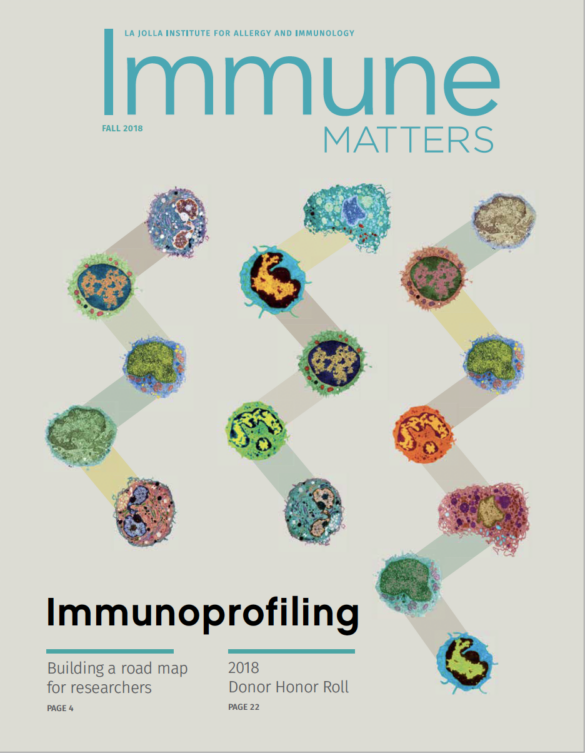 That work, led by LJI immunologist Klaus Ley, M.D., and published in the August 31, 2016, issue of Nature Communications, suggests a novel way integrins could be targeted to either dampen inflammation, as in the case of autoimmune disease, or to boost immune responses against infection. Many researchers thought that integrin receptors protruding from neutrophils became adherent via a “switchblade” mechanism. In it, resting integrins on neutrophils moving through the blood remain bent and minimally sticky until cells rolled over a region of infection. There, integrins underwent two sequential shape changes—step one always preceding step two—such that the bent head of the protein sprung open rapidly, exposing a hidden adhesive patch that glommed onto a protein in the vessel wall called ICAM-1. Human neutrophils labeled with monoclonal antibodies recognizing two integrin conformations (yellow and magenta). Cell bodies are highlighted by the cyan dye. Credit: Zhichao Fan, Ph.D. The new study reveals the knife to be more complex. 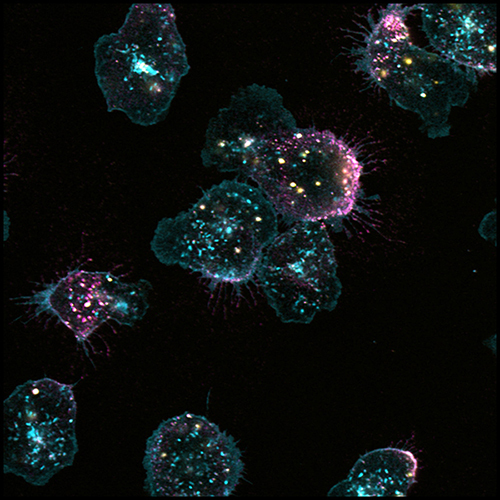 Combining high resolution microscopy called quantitative dynamic footprinting with methods to track human neutrophils rolling across an artificial surface coated with ICAM-1 and other signaling factors, Ley’s team observed that some neutrophil clusters did in fact exhibit integrins undergoing the conventional two-step activation mechanism. In other clusters, however, integrins assumed an unorthodox shape, one that exposed the high affinity patch but managed to hold the receptor in a bent conformation, as if step two had occurred prior to step one. Time-lapse analysis revealed that either cluster type eventually gave rise to fully activated, adherent integrins (with their blade fully sprung). There simply seemed to be two ways to spring it. The study’s blockbuster finding revealed what that mysterious sticky patch was doing in peculiar clusters of bent integrins. Discovering this required a different technique called FRET, often applied to measure distances between two molecules at nanometer resolution. That approach revealed that sticky patches in bent integrins were actually touching and binding to adjacent ICAM-1 proteins embedded in membrane of the very same cell, an interaction biologists call in cis. That contact locked the integrin receptor into off-mode, preventing it from binding to ICAM-1 expressed “across the way” on blood vessel cells, intercellular interactions biologists describe as in trans. Or, as new textbooks may say: High affinity in cis binding of neutrophil integrins to adjacent ICAM-1 molecules in the same membrane serves as an auto-inhibitory mechanism to block integrin engagement in trans with ICAM-1 expressed on cells in vessel walls, inhibiting adhesion and blocking an inflammatory response. The discovery that integrins restrain themselves like this has profound consequences for inflammatory disease. Monoclonal antibodies developed to specifically block interactions of neutrophil integrins with vessel wall proteins are already approved to treat coronary artery disease, autoimmune inflammatory bowel disease and multiple sclerosis. “This inhibitory mechanism opens the door to a new class of integrin modulators that work by a totally different principle,” says Ley. “Now, rather than designing new drugs to block the high affinity site, we could create small molecule drugs to counter inflammation by keeping the receptor in the auto-inhibited mode.” Ley says that small molecule drugs might be easier to administer and less costly than currently used monoclonal antibody drugs, which require infusion. Even better, molecules could be designed to do the very opposite, that is, force the snake to let go of its tail in order to push neutrophils into infection-fighting inflammatory mode. Other LJI contributors include Zhichao Fan, Ph.D., a postdoctoral fellow in the Ley lab and the study’s first author, and Sara McArdle, Ph.D., Alex Marki Ph.D., and Zbigniew Mikulski, Ph.D. Also contributing were Britta Engelhardt, Ph.D., and Urban Deutsch, Ph.D., of the Kocher Institute in Bern, Switzerland; and Edgar Gutierrez, Ph.D., Mark Ginsberg, M.D., and Alex Groisman, Ph.D., of the University of California, San Diego. The study was supported by funding from the National Institutes of Health, USA (NIH, HL078784) and a postdoctoral fellowship from the American Heart Association, USA (16POST31160014).